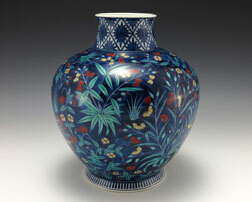 Blue porcelain vase decorated with red and yellow flowers and green foliage. There is a geometric design around the neck and foot rim. Note: This vase was handmade by Imaemon Imaizumi XII, and presented to President Gerald R. Ford on the occasion of the Emperor and Empress’s state visit to the United States. It was the first time an Emperor and Empress of Japan had visited the United States.